SINGAPORE, March 21, 2018 /PRNewswire/ -- AdRealm, a global digital advertising ecosystem driven by blockchain technology, has received funding from multiple top tier investment institutions. According to AdRealm, investors include Jian Sun from JLAB, Bo Shen from Fenbushi Capital, and institutional investors INBlockchain and FUNCITY Capital. AdRealm has partnered with UPLTV, an AI-driven mobile app monetization optimization service for developers and publishers, in the initial stage. UPLTV has received over $10 million in equity funding from Share Capital, Yi Capital, OuDe Capital, and QianMing Capital. 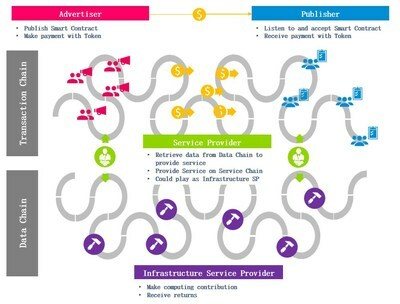 In response to the challenges above, AdRealm uses blockchain technology to reconstruct the way digital ad revenue is distributed and allocated along the value chain. Given the transparent and open source properties of blockchain, participants are given permission to view data content once agreed to follow chain protocol. Since all transactions are traced and immutable on the chain, this significantly reduces the transaction costs borne by third-party tracking and monitoring providers. Traditional ad platforms and large players will be "unpacked" into micro-services verified on AdRealm (micro-service provider model), eliminating centralized middlemen. Through coded parameters, AdRealm is able to establish standards for service terms of each provider, such as service term boundaries, revenue model, and data accessibility. As service performance is tracked and quantified, better performing service vendors will be ranked higher and given more service opportunities. All micro-service providers will compete fairly on AdRealm and earn accordingly to their service terms. Advertisers and publishers can choose the services they need and transparently track their spending and earnings across all stages of advertising. The growth of digital advertising and its complexity of processes and resources make "trust" an inevitable nature of business. Large industry players, based on their size and brand reputation, have relied on this trust for market share. AdRealm, however, is built on the belief that "code is trust" and trust is automated on the chain through decentralized distributed technology. Advertisers and publishers are no longer pressured to opaque service conditions and unjustified results. AdRealm builds a new way for digital advertising transactions by setting new rules of the game that is reinforced by code, eliminating the possibility of any manipulation beyond what is set by the code. The rise of programmatic and digitization of many processes of advertising lay a strong foundation for AdRealm to evaluate the quality of service through a quantitative way. Through a standardized micro-services provider model, historical records of all service providers will be stored on the chain and are accessible to advertisers and publishers for screening. Advertisers will no longer have to go through the strenuous process of employing DMPs, CDNs, rich media vendors, and other specialized services to reach the end user. Through AdRealm's smart contract, advertisers can effectively find suitable service providers accordingly to advertising needs. UPLTV is the third company by serial entrepreneur, Brian Xie, established in 2017. Xie's earlier ventures, Holaverse, has amassed 390 million users under nine months, setting a new record for Chinese mobile internet companies in overseas markets. Avid.ly, a mobile game publishing company, also gained success under 15 months to become China's largest casino and casual mobile game publisher for overseas markets. UPLTV was established in April 2017, with its headquarters located in Shanghai and additional offices in Seoul and Singapore. UPLTV focuses on global mobile game advertising monetization, providing both intelligent and customized solutions to raise monetization efficiency, outpacing similar platform performance by an additional 20% and more. UPLTV is currently working with over 300 game developers and publishers to realize greater in-app monetization efficiency, totaling over 30 million daily ad display volume. 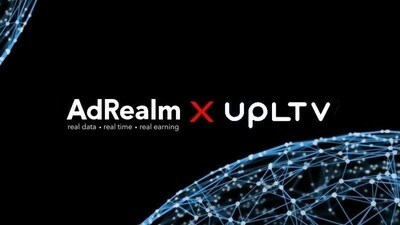 UPLTV will be the first service offered on AdRealm, helping AdRealm drive blockchain technology adoption in digital advertising to build a more open, fair and transparent ecosystem.